Welcome to Verywell’s Child Development Guide. Your children’s growth, needs, and challenges change quickly over the years—and your parenting concerns develop right along with them. Shifting your parenting strategies to keep up with your child’s growth is a big task, so in this guide, you’ll learn how to help your children thrive as they grow physically, mentally, and emotionally. Physical development: Learn how your child’s body is growing and changing and take notice of the new motor skills they are gaining at each age. Emotional development: Discover what type of emotional changes your child is experiencing at each stage and the emotional development milestones kids in each age group meet. Social development: Read about how kids interact, develop friendships, and connect with the world around them at each pivotal stage. Cognitive development: Uncover the critical thinking and intellectual skills kids develop at each age and learn about their speech and language development, the way they play, and the key cognitive milestones they reach. You’ll also find out how to know when to be concerned about your child’s development and what to do if your child doesn’t seem to be meeting key milestones on time. Diet and nutrition strategies for dealing with picky eaters, serving size suggestions, and information about what foods your child should eat or avoid. Physical activity recommendations, including the amount of exercise kids need, activity ideas for kids, and ways the entire family can become more active together. Tips for around the house to help you determine age-appropriate chores, how to spend time together as a family, and children’s roles within the family. Doctor visits to organize well-child checkup schedules, what type of doctor to see, common health issues by age, and recommended immunizations. Sleep guidelines to explain how much sleep kids need and how to encourage better quality sleep for your kids. Safety guidelines and strategies for keeping your kids safe. Your child’s world and how you can help them manage school or daycare, navigate new friendships, handle stress, and deal with bullies and other likely stressors at each stage. We hope this guide will help you dig deeper into your child’s developmental stage and gain an understanding of what you can do to best foster your child’s growth. Even though some days may seem to go by slow, 18 years will go by fast. We wish you and your child a happy, healthy journey and we’re honored to be along for the ride. 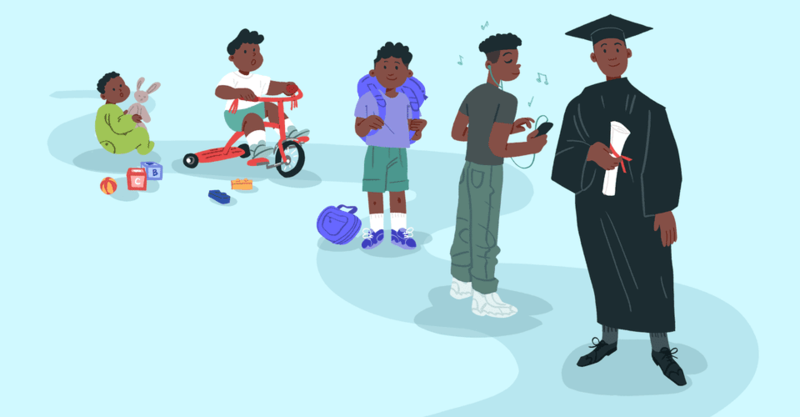 Here's a preview of what you can expect from each stage of your child's life in terms of development, discipline, and parenting strategies. One- and 2-year-olds develop at a rapid pace physically, emotionally, and cognitively. Their developing motor skills give them freedom as they begin to navigate the house. As they develop new language skills, they’re better able to communicate their wants and needs. There’s a reason it’s called the “terrible twos,” however. Toddlers are impatient and they don’t hesitate to show their displeasure. Temper tantrums are common as your child isn’t yet able to verbalize their feelings or cope with distress. Toddler discipline often involves physical guidance or even removing your child from the situation (like the grocery store). Child-proofing your home is a must during this stage, as toddlers are quick to climb on furniture, tackle the stairs, or get into things that could pose danger. They’re curious and they love to explore. Potty training can be a huge milestone during toddlerhood. Many toddlers are very proud of themselves when they can use the potty and many parents rejoice when they no longer have to change diapers. It’s important to take appropriate safety precautions, and it’s also important to ensure that your toddler is eating a healthy diet and getting plenty of sleep. But if you’ve got a picky eater on your hands or your toddler has decided to take a nap strike, don’t worry. These toddler parenting tips have got you covered. As your toddler grows into a preschooler, you’ll see some major social and emotional growth (in addition to physical growth). Your child will gain a little more control over their emotions and show interest in learning, playing with other kids, and pleasing you. Going to preschool can be a lot of fun for many little ones. For those with older siblings, it can help them feel like a “big kid.” For others, however, it can be scary. Some of them experience separation anxiety and being around teachers and other kids can feel overwhelming. Consistent discipline is key at this stage because preschoolers love to wear adults down. Whether they’re whining or asking “why?” for the 100th time, they can be good at getting their way. Fortunately, they’re also a lot of fun at this age. They love to learn and play and they can be quite funny and loving. Their changing bodies also means their diets and sleep habits are more important than ever. It’s a prime time to begin teaching them how to begin caring for themselves. They’re often eager to learn how to dress on their own and they may insist on doing as much as they can independently. You’ll see some big differences in your child between the ages of 3 and 5. And get ready, because your child is about to become a kindergartner. These parenting tips will keep your preschooler healthy and happy along the way. Once your child enters school, you’ll see some amazing progress in terms of learning. They’ll love coming home at the end of the day and showing you what they learned in school (at least for a little while). School-age kids also flourish socially. They develop stronger friendships and develop new interests and hobbies. However, you may hear a little more resistance from your child when you tell them to do their homework or clean their room. Defiance can be common as your child tries to test your limits. Discipline for school-age kids should include both positive and negative consequences. Use a negative consequence, like taking away your child’s electronics, when they break the rules. Offer positive reinforcement for good behavior, too. Praise them for trying hard or reward them for doing chores. Keeping your school-age child healthy can be a challenge. Their budding independence means they’re more likely to insist on staying up later or they may refuse to eat vegetables (even though they liked them last week). It’s a good time, however, to teach your child the importance of caring for their own body. They may show interest (sometimes) in caring for their own hygiene. Keep teaching your child new skills and you’ll see some big changes in your child’s independence between ages 6 and 9. These parenting tips for school-age kids will help you along the way. No longer a little kid, but not quite a teenager, tweens encompass a wide range of development. While some 10-year-olds are content playing dress-up, others are more interested in make-up. Girls at this age mature faster than boys. Some of them begin to enter puberty and body image issues may start to crop up. Boys usually begin puberty a little later. They’re often very proud of their changing bodies and developing muscles. Along with shifting hormones often comes mood swings and a shift in behavior. Your child may prefer to spend time with friends over family and may become a little more disrespectful than in the past. But don’t worry, that type of behavior is developmentally appropriate as your child is beginning to form their own identity, separate from you. As your child’s behavior shifts, they'll outgrow the discipline strategies that were effective in the past (they might even enjoy being sent to their room at this age). Try to find new consequences that will be effective for your tween. Technology is an important aspect of a tween’s life. Be sure to establish clear rules that will keep your child safe on a smartphone or when using the internet. Good health for a tween involves good nutrition (which can be quite challenging at this age) as well as a solid nine to 12 hours of sleep. Whether you’re dealing with non-compliance, homework problems, or bullies, we’ll help you find solutions to whatever you and your child are facing. These tween parenting tips can be a good place to start. When your child becomes a teenager, you might be wondering where the time went. The early years go by fast and now you’ve only got a few more years to prepare your teen for the real world. Your teen’s physical growth will slow down in the later teen years, but in the earlier teen years, it may feel like they outgrow their clothes in a matter of weeks. You’ll see a lot of emotional maturity in your teen in a few short years. They should gain better control over their emotions and, somewhere in the mid-teens, become less moody. There are a lot of exciting events in a teen’s life—a driver’s license, first romantic relationship, and a first job to name a few. It’s important to make sure your teen is ready to handle the added responsibilities. Teen discipline is most effective when it involves rewards for good behavior and consequences for bad behavior. Make your teen’s privileges contingent on their behavior. If they are responsible with chores and homework, you’ll know they can handle more. If, however, they shirk responsibilities, you might decide they're not yet ready for a driver’s license, a later curfew, or staying home alone overnight. Although your teen may have a fair amount of skills, there’s a good chance their social and emotional skills will need some fine tuning. It’s a good time to teach your teen new problem-solving strategies. An older teen will likely seek out your opinion. But don’t expect your 14-year-old to ask for your advice. At that age, your teen might insist you have no idea what you’re talking about. But don’t worry, maturity will change that. Safety issues in the teen years revolve mostly around risk-taking. Car crashes are the biggest danger to teens. Focus on teaching them to be a safe driver and a responsible passenger. In the meantime, buckle your own seatbelt. The teen years can be quite the ride for a parent. These teen parenting tips are a good place to get started.